In each millisecond, a masterpiece. Take a step forward. See those critical moments that had previously been invisible. Capture those moments that had previously been lost. Define them with a clarity that had previously been unattainable. For photographers who understand that photography is about critical moments, the D5 delivers an exceptionally sharp viewfinder image, stable even during 12 frames per second*1 high-speed continuous shooting. It features an incomparable autofocus system with 153 focus points including 99 cross sensors. It provides EXPEED 5 to maintain saturated colours and clarity between ISO 100 and 102400. Coverage is exceptionally wide, and a new buffer allows up to 200*2 NEF (RAW) images to be captured during one high-speed burst. 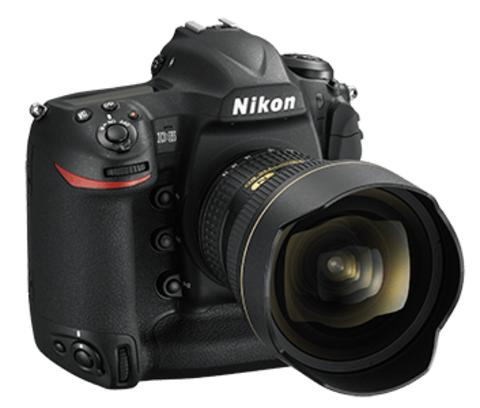 Combining 4K/UHD video capability, rugged reliability, a new radio-controlled flash system, wireless transmission and NIKKOR’s unparalleled lens line-up, the new D5 opens up a clear path for you to take your step forward. Endless new territory for your photography lies within each millisecond. Go there, and discover your masterpiece. Own the game with Nikon’s phenomenal new autofocus (AF) system. With an incredible 153 focus points and 99 cross-type sensors, the D5 offers exceptionally wide coverage. Whether you are shooting the race or the red carpet, almost every situation is covered. Small subjects moving at high speed can be tracked with a new level of precision. Subjects at the edge of the frame are easily detected, and vertical shooting is vastly improved. AF sensitivity down to -4 EV*3 enables superior low-light performance, and all AF modes have been improved. The system is configurable in 153-point, 72-point and 25-point coverage settings in Continuous AF mode. All 153 focus points are compatible with AF NIKKOR lenses with an open aperture of f/5.6 or faster, and 15 central focus points work with an effective aperture of f/8. The camera’s high-performance buffer allows up to 200*2 NEF (RAW) or large JPEG images to be captured during one high-speed burst: enough to cover an entire 100m sprint final without taking your finger off the shutter-release button. 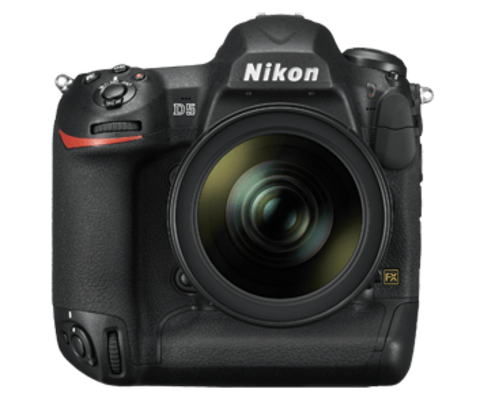 The phenomenal performance of the D5 is all you need to capture images that defy the odds. Thanks to a new AF ASIC unit, maximum computing power is allocated to AF at all times. No matter how fast the action, the camera does not compromise. Shoot at up to 12 frames per second (fps)*1with AE/AF tracking, or at up to 14 fps with mirror up. AF tracking and viewfinder visibility are vastly improved when shooting sports or any scene in which subjects tend to change direction suddenly. Faster sequential shutter and mirror mechanisms significantly reduce viewfinder blackout during high-speed bursts. For ultimate precision, pair the D5 with a professional NIKKOR lens equipped with SPORT VR mode, such as the AF-S NIKKOR 600mm f/4E or the AF-S NIKKOR 500mm f/4E. SPORT VR mode also delivers a stable viewfinder image when tracking high-speed movement. Combine the D5 with one of these lenses and you will capture fast-moving, unpredictable subjects with unprecedented smoothness. The sheer imaging power of the D5 is a liberating experience. 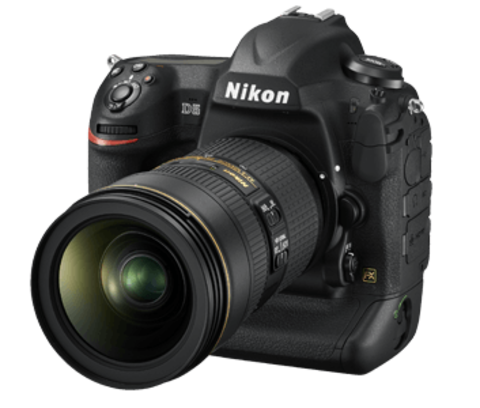 The all-new 20.8-megapixel FX-format CMOS image sensor and 180K-pixel RGB metering sensor deliver phenomenally accurate subject recognition and image detail. Even if you are shooting fast sports indoors, this camera will get you the shot. And not just any shot: tonal gradations are richer and more accurate. The D5 also boasts a new 3.2 inch, 2360k-dot LCD monitor, which offers touch operation in review mode. With a level of responsiveness comparable to smartphones, this high-resolution screen means you can easily check and select key images on the spot. Shoot in Live View and you can use touch operation to change the focus point, or acquire preset Spot White Balance data, based on the selected area within the frame. For even greater control, Picture Control 2.0 makes it easy to define parameters whether you are shooting stills or video. Ease post-production with the Flat pre-setting for maximum dynamic range and fine-adjust details with the Clarity pre-setting. 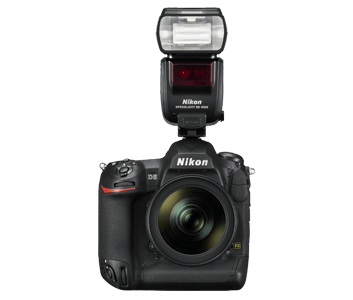 The D5 opens boundless possibilities for low-light shooting. With a standard ISO range of 100 to 102400, and the highest expanded sensitivity in Nikon’s history, the envelope is yours to push. Thanks to the camera’s new EXPEED 5 image processing engine, image quality is unprecedentedly high across the standard ISO range. This exceptionally clean performance is made possible by a signal processing system optimised for the new sensor&apos;s 25% higher pixel count. Fine noise is dramatically reduced and even cropped images shot at high ISOs retain their quality. In an incredible feat of engineering, the ISO range can now be extended to ISO 3280000 equivalent, at the Hi 5 setting. Designed for specialist use, such as surveillance or security applications, these astonishingly high ISO counts enable colour images to be captured without a flash in astronomical twilight, which is equivalent to an amazingly low 0.001 lux. As the first Nikon DSLR to record high-definition 4K/UHD movies in-camera, the D5 brings moviemaking flexibility to the forefront of the pack. 4K movies (3840x2160 pixels) can be recorded at 30p/25p/24p in dot-by-dot native pixel crop, which ensures the highest image quality. Shooting in Full HD (1080p) video allows you to record at frame rates up to 50p/60p in multiple sensor crop formats, including native Full HD pixel crop. And when filming in M mode, sensitivity for all video resolutions and crop modes can be set from ISO 100 all the way up to Hi 5. Auto ISO allows ISO 200 up to Hi 5, and allows you to configure the maximum ISO settings you want to work with. The camera offers clean HDMI out, where 4K movies can be recorded to the in-camera memory card or output uncompressed to HDMI with 8-bit 4:2:2 YCbCr. Furthermore, HDMI output is available for all movie resolutions during remote shooting. Faster, sharper, and easier to handle, everything about the D5 is geared towards a smoother experience. Engineered to incorporate feedback from photographers who spend all day shooting, this camera reduces the stress factors that come with the demands of professional photography. Ergonomically, improvements include buttons with more defined ridges and curves, which enable more intuitive control, especially when shooting through the viewfinder. 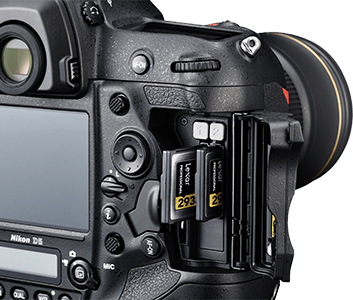 New double XQD card slots*4 easily handle the D5’s incredible capacity to shoot up to 200 NEF (RAW) images in one burst, and ensure the buffer is instantly cleared for the next burst. A new USB 3.0 port enables high-speed transfer of large amounts of data, and wireless and Ethernet connection is now 4 times faster. The rugged D5 is built with a magnesium alloy housing that repels even the most persistent dust particle or water droplet. The shutter unit is just as well-built, delivering phenomenal performance and outstanding durability no matter where inspiration takes you. 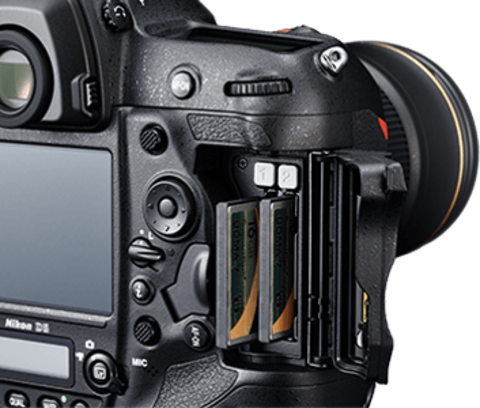 Optimise the D5’s capabilities with a wide range of accessories. Boost communication speeds and bridge distances with the WT-6, a new wireless transmitter that is compatible with the D5. 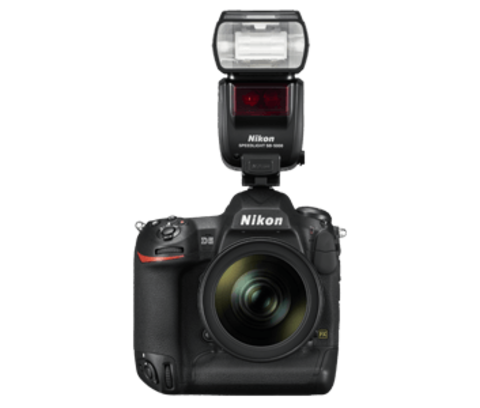 Nikon’s Creative Lighting System continues to go from strength to strength with the new Speedlight SB-5000. This new Speedlight utilises radio communication and improves the performance of Nikon flash systems under challenging conditions. From stills in the studio to 4K movies in the great outdoors, the D5 stands ready. Compatible with AF NIKKOR lenses, including type G, E, and D lenses (some restrictions apply to PC lenses) and DX lenses (using DX 24 x 16 1.5x image area), AI-P NIKKOR lenses, and non-CPU AI lenses (exposure modes A and M only). 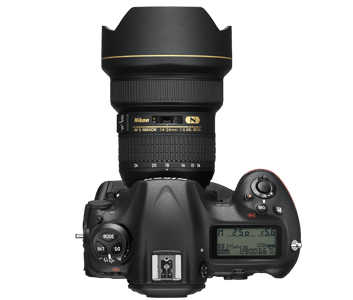 IX NIKKOR lenses, lenses for the F3AF, and non-AI lenses can not be used. The electronic rangefinder can be used with lenses that have a maximum aperture of f/5.6 or faster (the electronic rangefinder supports 15 focus points with lenses that have a maximum aperture of f/8 or faster, of which 9 points are available for selection). Auto (3 types), incandescent, fluorescent (7 types), direct sunlight, flash, cloudy, shade, preset manual (up to 6 values can be stored, spot white balance measurement available during live view), choose color temperature (2500 K to 10,000 K), all with fine-tuning.